“Unlike other secular recovery programs, Celebrate Recovery is based on God’s word and recognizes the, ‘One and true Higher Power.’ He is the rock and foundation of the program. Celebrate Recovery is for any hurt, hang-up or habit and covers any and all issues we face in our lives,” said Marcia Hauer, one of the volunteers that helped bring Celebrate Recovery to River of Life. Celebrate Recovery has been enlightening for Hauer and her family. Interested in learning more about the program? Join us Thursday, May 2 at 6:45 p.m. for our Celebrate Recovery informational night! Meet our leaders, learn more about the group, how it works, and ask any questions you may have. Find out how Celebrate Recovery can help you with any hurts, habits, or hang ups you may be dealing with. Does ROL offer any other Care Groups? River of Life currently offers DivorceCare, GriefShare, and Celebrate Recovery. 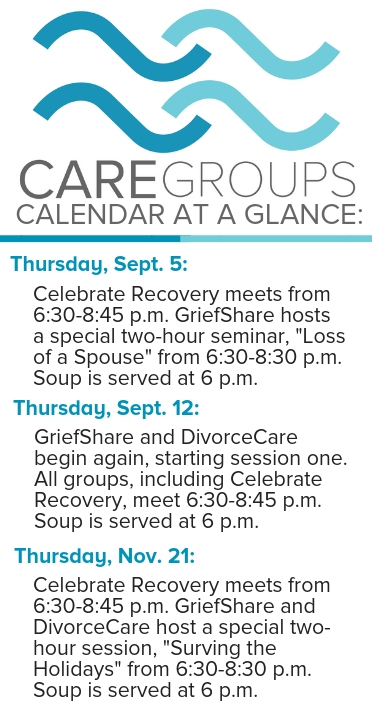 Care Groups meet Thursdays from 6:45-8:30 p.m. Each Thursday a soup dinner is served at 6 p.m. until groups begin at 6:45. Anyone is welcome to join at anytime. When it comes to choosing which groups ROL will offer, coordinator Denise Bowe says there are a lot of circumstances that go into the decision making process. While most Care Groups at River of Life will be wrapping up for the summer, Celebrate Recovery is a year-round program. DivorceCare and GriefShare will be concluding in May, and starting up again in September. It’s clear having that community has made an impact in both Hauer and Bowe’s lives. “It always reaffirms my faith when people come to Care Groups broken hearted and lonely – to see the changes in those that come week to week – from desperate brokenness to sharing with others, building relationships, finding hope and healing as they begin to rebuild their lives,” says Bowe. According to Bowe, the Care Group team members are a great support system. Acting as the hands and feet of God as they show their love and compassion to anyone that walks through River of Life’s doors. If you’d like to participate in any of the groups, all you need to do is come on Thursdays. “We believe every topic each week is important no matter where they are in their journey. Pre-registration is not required. Childcare is provided,” said Bowe. If you would like to volunteer, Bowe says the team is always in need of additional leaders. If anyone has a passion for helping others, please call Denise at the church office at: (763) 441-7527.